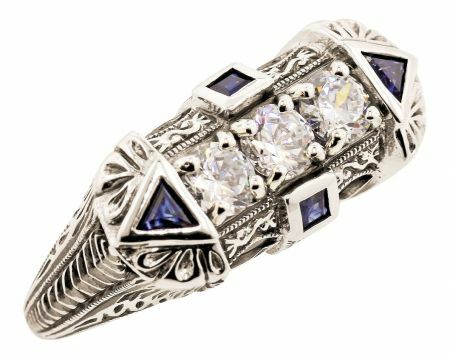 Description: An Art Deco style embossed filigree ring featuring (3) 3.5mm .17 carat equivalent cubic zirconia that are prong set in a single row with millgrain accenting. At each end of the cz's are (2) 3x3.0mm approx. .15 carat trillion shaped and (2) 2x2.0mm .10 carat French (square) cut genuine sapphires that are bezel set. The cubic zirconias have a total diamond weight equivalent of .50 carats and approx .50 cttw of sapphires. 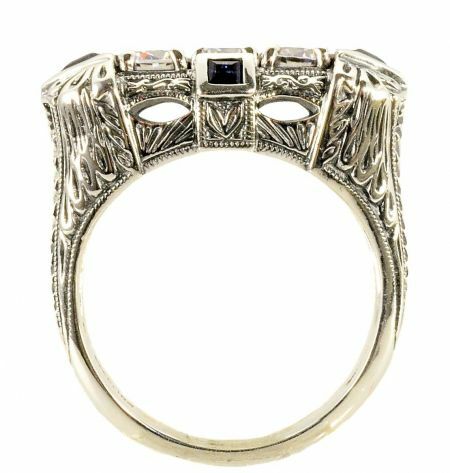 This ring is a reproduction of the cocktail or dinner rings of the 1920's that were and still to this day are so popular and highly sought after. Measurements: Measures 7/8"long x 3/8" wide x 1/4" high with the band tapering down to 2.0mm at the bottom. Shipping: Stock size 6, 7 & 8 ships in approx. 3 to 5 days. Resizing adds an additional week to shipment. I purchased this ring 18 months ago & words escape my description of how happy I am with it. The picture is quite accurate & to see it up close, it's even more beautiful. It is not cheap looking or flimsy. 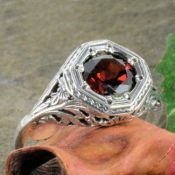 The amount of metal used is substantial & the ring has a nice heft to it. The stones are clear & not cheap looking. 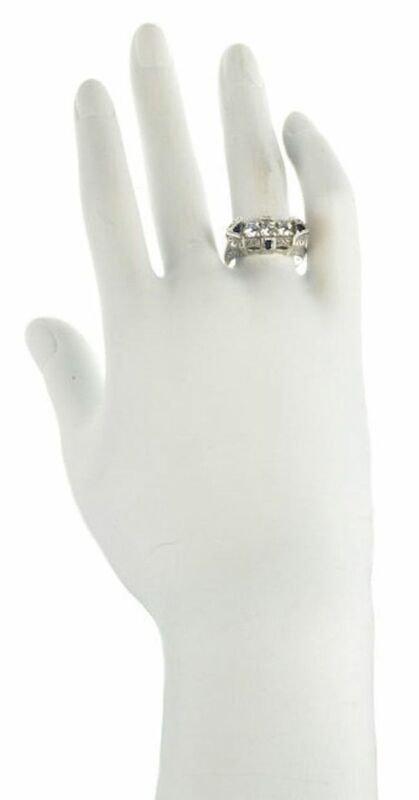 The cubic zirconias have a slight shadiness to them which helps them to look genuine. The sapphires are a lovely navy blue. The metal work & carving is exquisite, with the unique imperfections of handcarving, even if it's not. 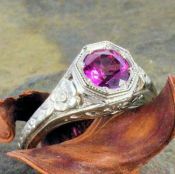 The oxidation of the silver makes this ring all the more beautiful. 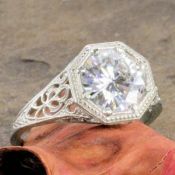 The quailty is outstanding & I would not hesitate to use as an engagement ring. This was my first purchase & I had to order a custom size which they accomodated with no problems & a true fit. I also was on a wait list for six months when it was originally out of stock. The customer service is superlative they bend over backwards for you! I will be ordering more items in the future. 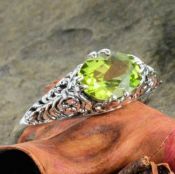 This ring is awesome. It looks like something my grandmother would have worn. The quality is incredible. 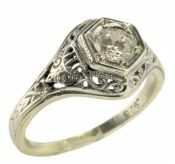 This is my third vintage ring I've purchased from this jeweler and they are all of superior quality. The silver is a nice substantial weight, NOT cheap looking. The CZ's sparkle and look like real diamonds. 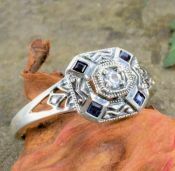 The sapphires are dark blue. I can't put into words how happy I am with this ring along with the previous 2 purchases. If you find something you like on this website, I highly recommend getting it. 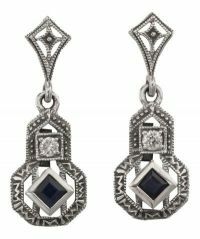 If you like the vintage look, the styles are so beautiful -- I can't stop buying them! I got this ring in all CZ.I cant stop staring at it!Its my new favorite piece of jewelery.It will definitlly be an heirloom piece to pass on to my daughter. 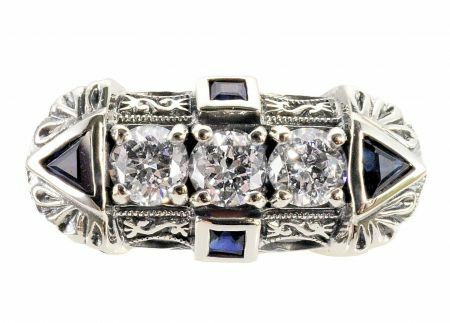 Great Quality,Detail is perfect and the stones look just like diamonds.It deserves TEN STARS.I will most certinally pass on this website!